I have just about finished reading and discussing the book Sammy and His Shepherd with my two oldest kids. The book by Susan Hunt is an explanation of Psalm 23 by using a story about Sammy, who is a sheep, and his shepherd. The story also includes another sheep who begins the story without a name but is simply called "My Friend" by Sammy. The book contains eleven chapters each treating a small portion of the classic Psalm. The narrative unfolds as My Friend understands and experiences the leading of Sammy's shepherd. The illustrations are modern and gritty which I really enjoyed. Furthermore the illustrations are not tame and really give some contour to the story. They are also friendly to all cultures as the shepherd is not presented as having blond hair and blue eyes. Each chapter is paired with a discussion section which is found at the end fo the book. The section has Scripture readings, reading comprehension questions and thoughts for living in light of what has been discussed. This is a great addition to the narrative and my kids like the discussion aspect of the book more than anything. Overall, I found this a welcome addition to our childrens library which addresses a wonderful Scripture in a way that is very contoured and real. Popular Bible verses sometimes make it on to coffee cups and thereby loose their intended meaning - this is not so with Sammy and His Shepherd. Remember, the valley of the shadow of death is not a happy place. One final note, the book uses the ESV translation - always a plus for me. There are times in life when something truly exceeds the expectations you had for it. Recently, my daughters (5 and 3) and I were pleasantly surprised. I love good resources for teaching children and walking through biblical and theological themes with them. Unfortunately much of what is out there for kids can be a bit cheesy, not as gospel centered, and many times has illustrations that make Jesus look like a white European woman in a dress. When I read about a new kids Bible endorsed by Tim Keller, a pastor of whom I think quite highly, we ordered it up in one of the those wonderful little brown Amazon.com boxes. What arrived was actually quite delightful. The Jesus Storybook Bible is written by Sally Lloyd-Jones and is illustrated by Jago (one word named people are usually cool...or weird...in this case cool). The title of the book is very appropriate as this is a book of Bible stories. The difference here is that the stories are all told from a christological standpoint with Jesus the foreshadowed rescuer in every narrative. To be honest the understanding of theological typology in the Old Testament demonstrated by Lloyd-Jones is wonderful and her writing causes the reader the feel the expectation of a coming Messiah with great anticipation. Jesus is found on every page, subtly anticipated in every story. Indeed, the subtitle of the book "Every story whispers his name" is very accurate for the text written by Lloyd-Jones. It should be noted that this is a narrative based closely on biblical content, but not a translation of the Scriptures. I do not think this detracts from the work but the term "Bible" might throw some people. The illustrations are both age appropriate and fun for children but also culturally sensitive. In other words, the pictures are enjoyable and Jesus looks like a guy who was likely a middle eastern Jewish carpenter. Jago's style is unique and creative, with almost all of his work done digitally. You can see a sample by clicking on the following image. Finally, I would recommend this for anyone to read to familiarize with Christ-centered, redemptive-historical, narrative theology. The text is engaging and serious enough for all ages to gain from it. I highly recommend the fathers out there to read this to their children. There will be benefit to all involved. Tim Keller sums this up well so I will let his words end the review. I think they could easily have been titled - Big Thoughts for making Little Thinkers as they do bring forth sound theological concepts for the kids. Just about every page has small Scripture references to be utilized by the parents. The volume on the trinity even has a copy of an ancient creed - Kayla and I read it getting loud and fired up about all the great doctrines and truths taught in the creed. Fun. Mr. Allen, if you read this I would suggest the following as additional titles, but I guess you may already have some in the works. The Atonement - uniting the Old Testament sacrifices with NT teaching (ie Hebrews), and perhaps weave in all the intensions God has for the cross. The Son of God - hit the hypostatic union, Jesus as Son of God, Son of Man, and the Messiah of Israel. The Blessed Hope - not too specific as to avoid the post, pre, a, pre-mid-post stuff - but Jesus sure return as our blessed hope would be great. 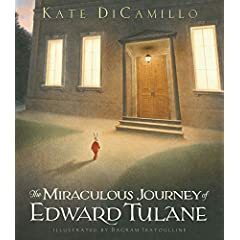 I am almost finished reading a fantastic children's book called the Miraculous Journey of Edward Tulane. A friend of mine recommended the book and I ordered for future reading with my little girls. From the glowing reviews and the video interviews I was expecting it to be a pretty good read. What I wasn't prepared for was the sheer delight I have had reading this to my daughters. The story is about a pampered little toy rabbit named Edward Tulane (he would not like you to call him a doll) who is made of china and dressed in fine silk clothes. His owner is a little girl named Abilene who loves him very very much. Yet there is a problem with little Edward; he cares nothing for anyone but himself. In fact he finds people to be a bore and is rather uninterested in anything but his own fine look and standing. Yet then he goes on a very unexpected journey. I do not want to ruin the story with too much of a summary so I will just recommend you read it to your kids. I am not sure of the author's worldview, and perhaps their is a bit of sentimentalism happening, but the message is clear. Redemption through love and grace is the path to redemption of Edward Tulane. I still have to finish the book; we'll do that tomorrow night. If the last third of the book is anything like the first two thirds I will have to give Edward Tulane's Miraculous Journey a high five stars. Every now and again you just run across something very useful on the web. 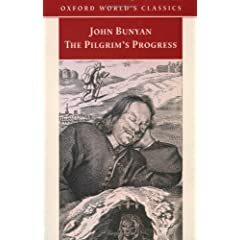 Many of you are aware of John Bunyan's classic, the Pilgrim's Progress. Many find it a bit unwieldy to read and stay away. Others find abridged versions which gut much of the content...might there be a better way? I have recently found a few resources that are very helpful in jumping on the Pilgrim Road with Christian out through yonder wicket gate. First, every now and then you run across fantastic entries on Wikipedia. Some of course, you have to be careful with, others are just dandy. In reading about about Pilgrim's Progress, I found this delightful Wiki about Bunyan's bountiful book. The page is complete with a concise plot summary and a thorough listing of all the characters. It is amazing to see all the characters in the work; mind you that these flew from the mind of a Bible soaked man languishing in Bedford Jail (pictured to the right). Also, the wonderful (and not so wonderful) places visited by Christian are listed out and described for the curious reader. 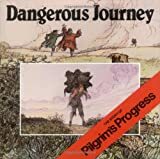 This page can serve as a great appendix for the reader who wants to follow the narrow road through Pilgrim's Progress while learning the message found therein. Second, I had wanted to read this story to Kayla (almost 5 now) for some time but knew she might need to get a few years past 4 to understand it all. However I found a great solution. There is an excellent unabridged audio book version available from Blackstone Audio presented by audible.com. The narrator is Robert Whitfield and he does a crazy good job. He uses different voices and accents for different characters making the listening task a joy. Kayla and I have been listening when we ride together in my car. We stop it to discuss the imagery the characters, why the are presented a certain way, etc. Too much fun for Daddy and Daughter. It is availble for $31.95, I bought mine from the iTunes Music Store and find it well worth every penny. Finally, LibriVox (a web site that provides free audiobooks from the public domain.) 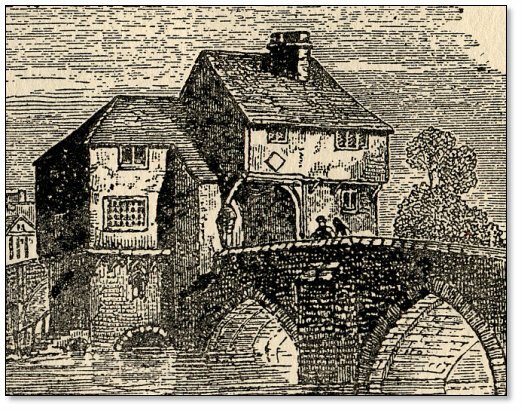 has an excellent Pilgrim's Progress Page featuring another audio version of the book (free) and several links to the full text of the book online. I recommend the Whitfield reading (see right above), but if the budget is too tight for the 32 bucks, this is a good free option. Downloads in MP3 and OGG. There is a reason this work is the 2nd most translated in history behind the Bible - it is strong sauce for the soul who is on his way to the heavenly city. Get it, read it, listen to it. Strong medicine for our spazzed out, media jumpy age.